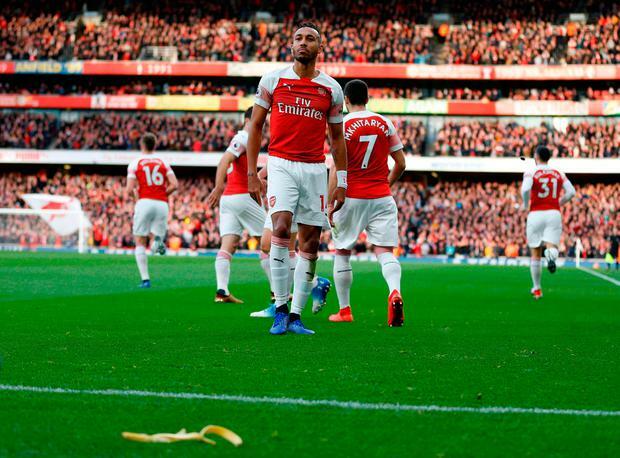 Former Arsenal striker Ian Wright believes the Tottenham supporter who threw a banana skin onto the pitch after Pierre-Emerick Aubameyang scored in Sunday's north London derby has embarrassed Spurs and the Premier League. Following the Gunners' 4-2 win at the Emirates Stadium, Metropolitan Police confirmed seven arrests were made. Press Association Sport understands one of those arrests came after a banana skin was hurled from the away end as Aubameyang celebrated scoring an early penalty in front of the Tottenham fans. Tottenham have said the supporter involved will be banned. Wright, speaking as a pundit on Match of the Day 2, said: "It's ironic really in a week where I present a show celebrating the pioneers and how far we've come. "I've played against Spurs and I've taken a lot of abuse from Spurs but never ever has it been racial. "Now Spurs have to deal with this because some idiot has done that. "It's not only embarrassed Spurs but it has embarrassed the Premier League because it has gone around the world, and now Spurs have to deal with that and have that tainting all over them. It's really unfortunate to see." A Tottenham spokesman said: "Behaviour such as this is completely unacceptable and the supporter in question will be issued with a ban." There were also six arrests for public order offences - at least two of which are believed to be Arsenal supporters who lit smoke canisters during the match. Gabon forward Aubameyang opened the scoring on Sunday with his 10th-minute spot-kick and, after Tottenham had replied through Eric Dier and a Harry Kane penalty, then equalised early in the second half. Alexandre Lacazette subsequently put the hosts 3-2 up before Lucas Torreira added Arsenal's fourth. Mark Mann-Bryans Arsenal reached a second successive Europa League semi-final as they deservedly beat Napoli at the San Paolo Stadium to ease into the final four. Sam Dean Unai Emery has vowed to go on the attack in the second leg of their Europa League quarter-final as Arsenal look to prevent a Napoli resurgence in Italy.